In episode 6, Due Process, Diaz has gone after Anatoly in Russia. He takes his revenge on Anatoly by torturing him for his betrayal and tells him he will help in destroying Oliver. Felicity and Laurel find out about Diaz’s trip and figure out he went after Anatoly. They find Diaz and the Longbow Hunters on a camera at a warehouse and decide to go after them on their own. 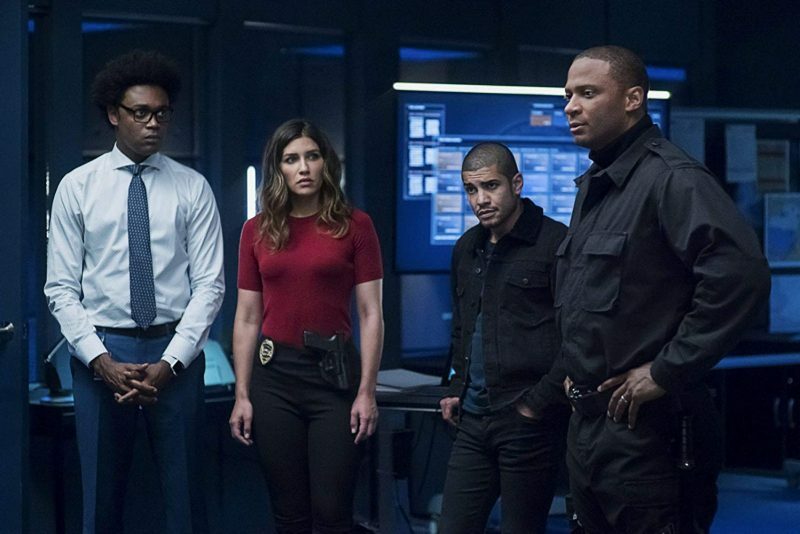 After they arrive, Renee and Diggle with ARGUS officers intercept them. Silencer’s tracking device is still on her belt and they track it to a cargo box. When they open it, they find Anatoly tied and gaged along with a bomb counting down with 30 seconds left on it. They all rush out of the warehouse just as the bomb goes off. Felicity and ARGUS then find out Diaz is working with a weapons dealer Anatoly knows. He is asked by Diggle and Felicity to go undercover to get a copy of his files. Anatoly strongly declines, but is talked into working with ARGUS, SCPD, and Felicity. Anatoly succeeds getting into the weapons dealer’s warehouse and gets to his computer. But when things are starting to look threatening for Anatoly’s safety, Diggle tells him to get out but Felicity tells him everything is fine as the files are being downloaded to a flash drive. Just as the download is completed, Anatoly runs into trouble and Diggle has to be rushed in. Anatoly is punched out unconscious with the flash drive still intact. When they get back to ARGUS, Felicity is able to decipher the information. She finds out Diaz is planning to plant bombs around a particular building that can destroy Star City. 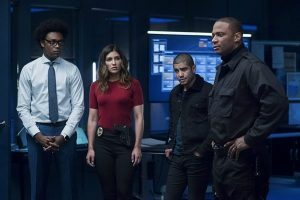 Felicity, Renee, Dinah, Diggle, and Curtis are able find each bomb and deactivate them and disable the remote Diaz has. Diaz is on the roof and like the last time, the Green Arrow was there and fired an arrow to disarm him. Diggle is also there to see this and as Diaz is amazed beyond belief there is another Green Arrow, Diggle knocks him out with a punch. In the last segment of Due Process, Diaz is brought into police custody. Felicity felt there was only one way to put Diaz forever out of her and her family’s lives. She grabs a gun, goes into the interrogation room, and points it at Diaz. With determination in her eyes and Diaz taunting her that she’ll never pull the trigger, she is stopped by Laurel by telling Felicity she made a deal with the FBI in exchange for the freedom of Oliver. But Diaz had other plans in The Slabside Redemption. He freely goes to Slabside in an armored police vehicle surrounded my officers. Although, everyone should know by now, Diaz doesn’t go quietly and has his sights on getting revenge on Oliver no matter what. When he arrives at the prison, a hired man takes down the police who brought Diaz and he goes into the Visitors area of the prison in a disguise without being recognized. He makes a visit to Oliver threatening him and saying once he is done with Oliver he is going to finish the job with Felicity. Oliver tries to tell the guards Diaz is right there, smashing the window and tries to fight off the guards. Diaz is feeling the thrill, dresses as a guard, and goes straight to the courtyard to gain more followers and takes over the prison. 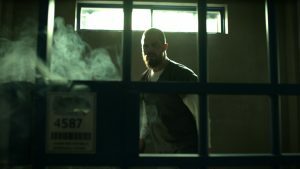 The Slabside Redemption is nothing but fight sequences (thank you Bam Bam) against Oliver, Diaz, Sampson, Brick, and the other prisoners of Slabside. To go after Diaz himself before anything was about to happen, Oliver is able to open up his cell with a homemade (or cellmade) bomb. After getting past the guards who told him to stand down, he goes after Diaz. 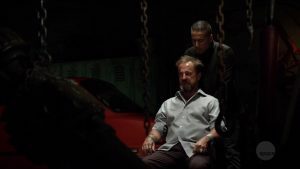 But before Oliver can find Diaz, he opens up all the cells and has the inmates take on the guards. Hanging them and beating them to a pulp. After apologizing to Turner in falsely accusing him for the death of the guard Stanley killed, he helps Oliver take back the prison and helps save the guards that are left to save. In the fights, Oliver doesn’t kill anyone. Not even Sampson (Oliver cuts him on the leg, but we see he is still around near the end of the episode) or Brick (killed by Stanley). NOT EVEN Diaz who is the last fight of the episode. But he is able to take down Diaz closing the prison door of inmate 4587. Battered, bloody, and bruised Oliver leaves Slabside and walks out of the prison into the arms of Felicity as Diggle watches. The next episode, Unmasked, Oliver is back in the suit and everyone knows he’s Green Arrow. Will the other Green Arrow be unmasked too since Oliver is back??? ?